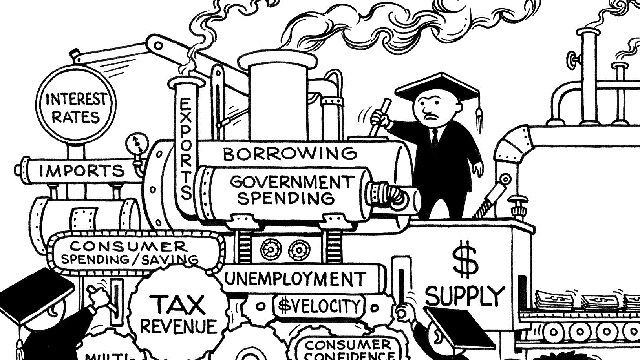 Economics is seen by most of us as one of the most boring academic disciplines: it’s all the computation of a Math degree, with the fevered opinion of a Poli-Sci degree, and most of the public understands it about half as well as they understand either of those. And so daunting and courageous it is to see artists and writers undertake the so-called “dismal science” to the pages of the graphic medium. 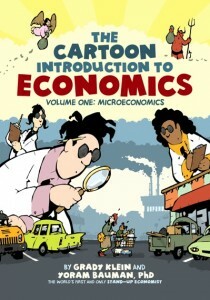 There are a variety of “economic comics” to chose from out there and each one has a different approach to the field. If you came to me asking for a starting point in this arena, my surefire response would be to go out and get a copy of Economix: How Our Economy Works and Doesn’t Work In Words and Pictures. More: www.economixcomix.com is the official website. Purchase the book in our store here. Goodwin tells the story of the development of economics theory from its pre-Enlightenment nascent state, to the convoluted mess that we are left with today. 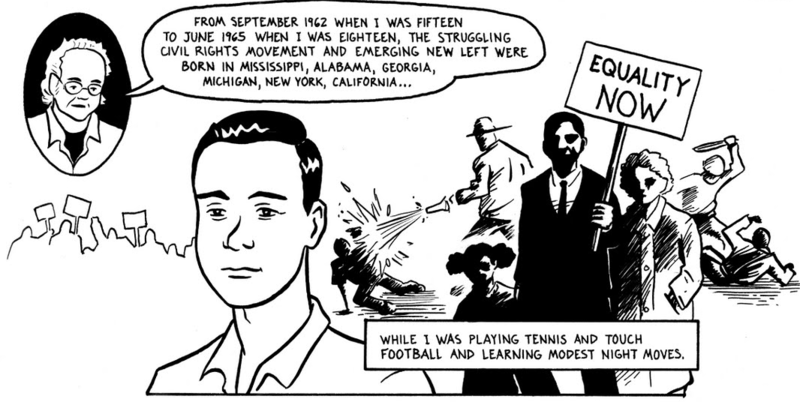 As the comic starts to venture into the present day, Goodwin admits his own political ideas and history. It is this author’s assumption that “…today’s justifications for extreme inequalities of wealth and power are horse-pucky, just like yesterday’s, and will completely fade away.” In other words, there’s absolutely no need for a 1% to make the system work for the other 99%. Goodwin is totally unafraid of the controversy he might stir up, and backs that confidence with historical insight. He then proceeds to dissect, in detail, the revolt of the rich and powerful and the means by which they have solidified their hold on our economy and by extension, the future. 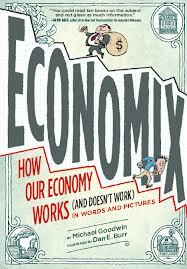 Economix was the first book I stumbled across when I delved into this topic, and it’s great. It’s a clear, factually accurate critique of how the development of economics as a science has left the real world out of its equations and how that lack of depth has brought us to a critically unstable tipping point (enter perennial economic depressions, repressions, slow-downs, melt-downs… and whatever else they’re going to call it next year). Goodwin’s history is complete and in depth while Barr’s artwork presents a blend of historical personae and visual metaphor (corporations are presented throughout as giant anthropomorphic factories). Regardless of your politics or level of understanding, this book will leave you knowing more about economics. With regard to politics; it will either solidify your case against the continued concentration of power driven by unfettered market slavery or at least make you question your belief in laissez-faire capitalism. 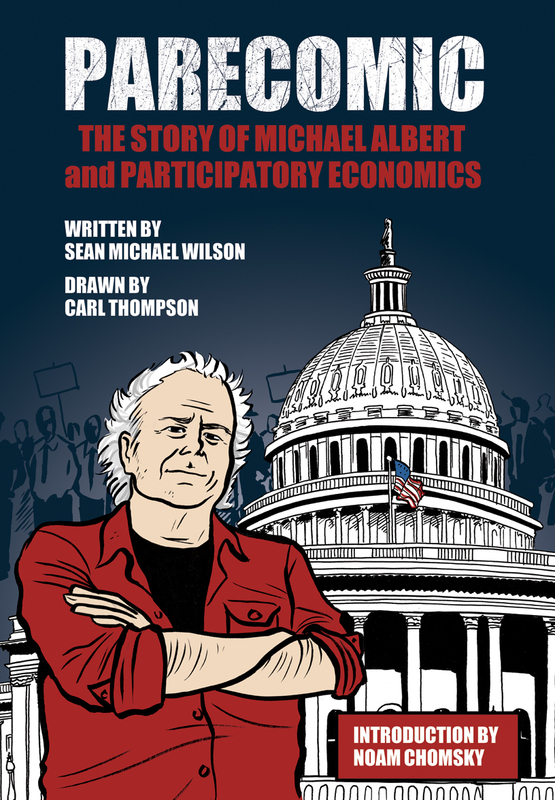 Parecomic is the story of how economist Michael Albert started out in economics and activism and ultimately merged the two by forming an innovative new system of organization that rejected the myopic view of mainstream Marxism and what is known as the “Economic Left”. The story really isn’t so much about economics as it is about the journey Albert went though in creating Participatory Economics, his theoretical replacement of the existing order. The book goes into to quite a bit of detail about Albert’s critique of main stream Marxism and how he adapted the class dichotomy into a more nuanced view of the class divide, a problem which he then set about solving. The result was a system similar to Syndicalism in which the workers collectively own and operate the means of production and compensation is determined, not by output, but by the burdensomeness of the tasks completed and the dedication with which a worker performs their appointed duties. The political impact of the book is, for now, rather small. But it is valuable in that it goes beyond economics to lay out a vision for a more intricate view of the incentives and motivations of humanity. Like all other comics about economics, it also surely opens up discussion with readers who would never otherwise read anything by Michael Albert. Of all the works I have looked through for this article, Parecomic has the strongest art. Thompson captures the development Albert and his colleagues and friends with a surprising subtlety given the black and white medium and that in most cases he is trying to accurately represent real people. This superficial analysis is matched by equally lack-luster art. The drawings are not bad per se, but they don’t really do much to grant life to the topic. Several characters are represented as children, superheroes and various other metaphors for the topics discussed, but they tend to fall flat to drawings that look like Sunday paper political cartoons, a style that’s great for a couple panels but doesn’t help to carry a book. Lastly, for those of you looking to find more out there on the wonders of economics: you can, as always, turn to the web. 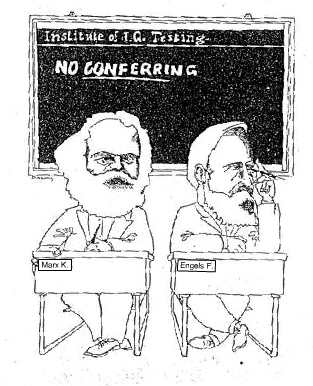 I found one site particularly enlightening that was devoted to Marxism and its critique of capitalism. The website does a great job dissecting the flaws and inherent unfairness in a capitalist system and suggesting the merits of Marxism through a series of political cartoons. The art is nothing to write home about (these appear to be scanned photocopies of an old publication), but the humour and information is of serious quality.